Trapped objects management by Emergency Dentist in Kingston, London. Many people will know the irritating feeling of getting an object trapped between their teeth. Generally, food is the most common issue. However, fillings can also sometimes become loose and get trapped between teeth. This can result in patients needing to see an emergency dentist. 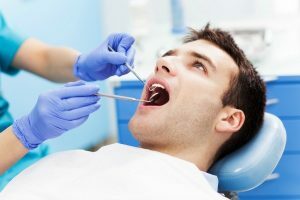 When should I seek help from an emergency dentist? In a number of cases, patients will be able to remove the item without the help of an emergency dentist (by brushing or using floss). However, it is extremely important that patients do not use sharp objects to try and remove the debris. When fillings become loose but do not debond completely, they allow bacteria to trap beneath them and rapidly destroy tooth tissue in a very short period of time and lead to toothache. In such cases booking an urgent dentist checkup is very important to prevent severe tooth damage. Maintaining a high standard or oral hygiene can help an individual avoid getting food or objects stuck between the teeth. In between visits to the dentist, there are a number of simple steps people can take to limit the risk of developing tooth decay, gum disease, and many other dental problems. Brushing teeth thoroughly twice every day with a soft-bristled toothbrush, and flossing daily. Using dental products that contain fluoride, including toothpaste and mouthwash. Eating a balanced diet that is rich in nutritious fruit and vegetables, while avoiding snacks including high quantities of sugar in between meals. Regular dentist checkups are vital for prevention. This enables the early treatment of any issues before they become worse. If left untreated, many oral health issues can result in the requirement of painful and often costly procedures. Pearl Dental Clinic is open 7 days a week from 9am to 10pm. You can book a dental appointment by calling us on 0208 547 9997 or emailing us or book an appointment online (24 hours).